Top talents Sidney Crosby and Alex Ovechkin lead the list of stellar signers on this RBK Authentic NHL All Star jersey from 2007. The white knit/air-knit combo with embroidered Eastern Conference logo sewn onto chest is tagged in the neck by RBK with the size 50 flag tag below. Best is the Dallas 2007 All Star Game patch up on the left shoulder! 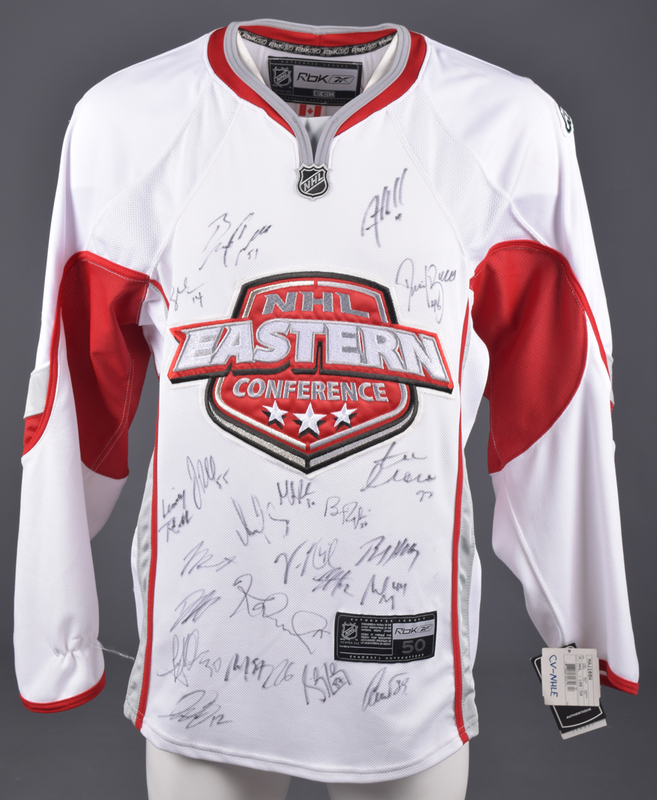 Signed across the front in black marker by 22 of those who played on the Eastern roster: Alex Ovechkin, Sidney Crosby, Martin St. Louis, Martin Brodeur, Tomas Kaberle, Jason Blake, Simon Gagne, Brian Campbell, Vincent Lecavalier and more! In new condition with hang tags attached.